Claire North used the travels of the main character in her last book The End of the Day to highlight global inequities and social issues. Despite its fantastical premise (that character we the harbinger of Death), that book focussed on the present. 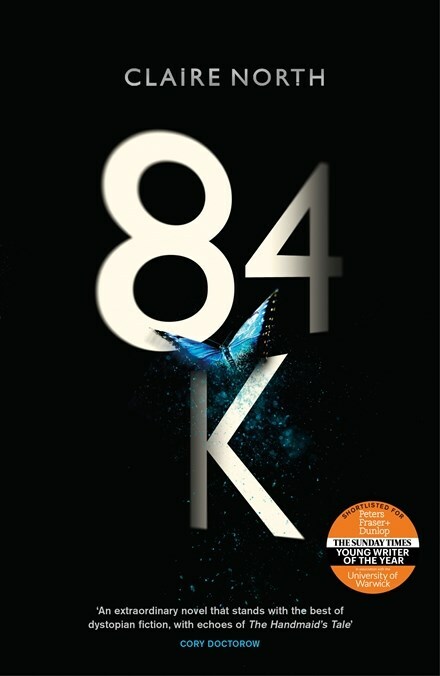 In 84K, North takes this social commentary into frighteningly plausible dystopian vision of the future. There is nothing particularly original about the starting point for 84K – concentration of corporate power, collusion between a monolithic Company and the Government, the wealthy coming out on top and a population sleepwalking into servitude in the pursuit of the good life. But North takes this premise further – into a monetised society, where everything, including human life, literally has a value. Theo Miller works at the Criminal Audit Office, assigning indemnity value to different crimes, If you can pay you get on with your life but if you can’t, you go into government mandated menial work – essentially slave labour or worse. Miller, is much like Charlie from The End of the Day, a grey English bureaucratic exterior hiding a revolutionary soul. And that soul slowly emerges and he is forced to take action when a face from the past emerges and he is forced to reevaluate his life. The book jumps between three time periods – Miller’s backstory, his quest to bring the Company down, and the aftermath of that quest. North uses a stuttering, sliding narrative with hanging sentences and broken scenes which jump between these periods and can become a little wearing. While there is plenty of action in 84K there is also a lot of speechifying and labouring of the point. But all of this ultimately is in the service of a timely, cautionary tale with a human heart that, like all good dystopian fiction, challenges readers to really think about the way the world might be going. This review first appeared in Aurealis #112, Australian Science Fiction and Fantasy Magazine, www.aurealis.com.au.